Police believe 829 people were "likely" victims of phone-hacking by newspapers, the Leveson Inquiry has heard. 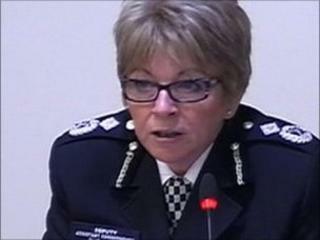 Deputy Assistant Commissioner Sue Akers confirmed to the inquiry that 581 of those had been contacted. However, 231 could not be identified, and 17 had not been told due to "operational reasons". She is overseeing three investigations involving claims of newspaper hacking. Ninety police staff are involved in Operation Weeting. So far, 17 people have been arrested, with two released without any action, and the remaining 15 due to answer bail in March, Ms Akers said. The "likely" victims are those whose names and other details appear in documents belonging to the former private detective employed by the News of the World, Glenn Mulcaire, who was jailed in January 2007 for phone hacking. Ms Akers said the number of people who had written to police asking if they were hacked was 2,900. Of those, 1,578 actually appeared in Mulcaire's 11,000 pages of notes. She confirmed to Robert Jay QC that there were 6,349 potential victims - identifiable names of people in information held by Operation Weeting. The number of those names with phone numbers was 4,375. Operation Weeting is into allegations of hacking by News of the World into private voicemails, Operation Elveden is looking at allegations of journalists from News International (owner of the now-defunct News of the World) made "inappropriate" payments to police, and Operation Tuleta is investigating computer hacking. There are 40 police offiers and staff are working on Operation Elveden, but the team is due to expand to 60 as the inquiry has widened to include the Sun newspaper, Ms Akers said. She said that Operation Tuleta had smaller resources than the other two, with about 20 officers, she said. It was looking at 57 separate allegations of data intrusion, including some which date back to 1980s. There was 4TB of electronic data to examine. Her appearance comes during the first part of the Leveson Inquiry, sitting at the Royal Courts of Justice in London, looking at the culture, practices and ethics of the press in general. The second part, examining the extent of unlawful activities by journalists, will not begin until detectives have completed their investigation into alleged phone-hacking and corrupt payments to police, and any prosecutions have been concluded. Ms Akers also confirmed details about Operation Kalmyk, a sub-inquiry of Tuleta, which is looking into illegal accessing of computers belonging to others for financial gain. She said one person had been arrested under Operation Culmic and was on bail until March. Dan Wootton, former News of the World showbusiness editor, told the inquiry that when he started at the paper in 2007 he was given a pocket-sized copy of the Press Complaints Commission guidelines, which he said he carried with him "at all times". He said stories about celebrities were nearly always checked with the person involved, or their agent, before publication. He said none of his stories were gathered using subterfuge, with about half of them coming from celebrities themselves. He could only recall one occasion where senior staff told him not to confirm the facts with the celebrity. He said when it came to public interest, celebrity stories were discussed on a case-by-case basis. Wootton says he would not write about actor Hugh Grant, for example, because "he didn't seem to enjoy being a celebrity". He said it was "naive" to say you can be a Hollywood celebrity and then complain about press attention. He said "all celebrities have a right to privacy", for such issues as sexuality, pregnancy, health issues and details involving their children. Sunday Mirror reporter Nick Owens told the inquiry about his undercover work for stories involving traffic wardens and a turkey farm, saying they were in the public interest. He agreed with Lord Justice Leveson that he had been "economical with the truth" when it came to applying for the jobs in order to write the stories. In March 2009, Owens was filmed by film-maker Chris Atkins in an undercover sting apparently suggesting the Sunday Mirror would pay for celebrities' medical information. He said it was an informal meeting to find out if Atkins had any information about celebrities, and that no information was published as a result of it. Editor-in-chief of Associated Newspapers Paul Dacre, publisher of the Daily Mail, will also give evidence. Mr Dacre has previously said that self-regulation overseen by the Press Complaints Commission should continue. He is expected to be questioned about the use of private detective Steve Whittamore who was convicted of illegally accessing data in April 2005. Socialite Jemima Khan will also give evidence about press intrusion into her personal life. Her written statement comes after actor Hugh Grant told Lord Justice Leveson that a story about their relationship was likely to have come from illicit eavesdropping.